The global T-cell acute lymphoblastic leukemia market is driven by rise in prevalence of T-cell acute lymphoblastic leukemia. The global market is projected to grow at a rapid pace during the forecast period. This is attributed to increase in cancer awareness programs and strong product pipeline. T-cell acute lymphoblastic leukemia (T-ALL) is a type of acute lymphoblastic leukemia, with features similar to lymphoma. It affects white blood cells called T lymphocytes. T-ALL is most common among children aged over 5 years. Treatment of this disease includes chemotherapy, radiation therapy, bone marrow transplant, targeted therapy, and immunotherapy. Rise in prevalence of T-ALL and rapid technological advancements boost the global T-cell acute lymphoblastic leukemia market. According to the American Society of Clinical Oncology (ASCO), T-cell acute lymphoblastic leukemia accounted for 15% to 20% of all acute lymphoblastic leukemia. According to a recent study, in 2017, nearly 5,970 cases of acute lymphoblastic leukemia (ALL) were reported in the U.S. About 4 in 10 cases were in adults. Moreover, increase in health care expenditure and rise in number of clinical trials are expected to fuel the global T-cell acute lymphoblastic leukemia market. The global T-cell acute lymphoblastic leukemia market has been segmented based on treatment, end-user, and region. In terms of treatment, the global market has been classified into chemotherapy, radiation therapy, bone marrow transplant, targeted therapy, and immunotherapy. The chemotherapy treatment segment accounted for major share of the global market in terms of revenue in 2017. The segment is projected to expand at a significant CAGR during the forecast period due to its high prescription rate, wide range of products, and easy availability. Based on end-user, the global T-cell acute lymphoblastic leukemia market has been categorized into hospitals, clinics, and others. The hospitals segment dominated the global market in 2017, and the trend is likely to continue during the forecast period. This is attributed to the increase in health care infrastructure, favorable reimbursement policies, and surge in awareness among individuals about T-ALL. Moreover, hospitals provide advanced medical treatment to treat T-cell acute lymphoblastic leukemia patients. 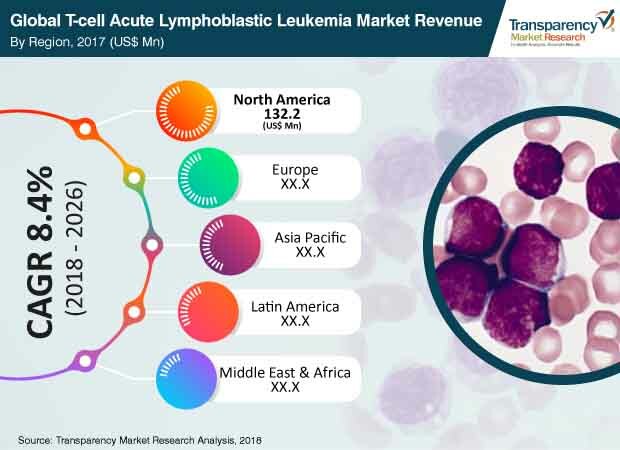 In terms of region, the global T-cell acute lymphoblastic leukemia market has been segmented into North America, Europe, Asia Pacific, Latin America, and Middle East & Africa. North America dominated the global market and is projected to gain market share by the end of 2026. The market in North America is driven by increase in incidence of T-cell acute lymphoblastic leukemia, new product approvals, strong product pipeline, and rise in health care expenditure. The T-cell acute lymphoblastic leukemia market in Asia Pacific is anticipated to grow at a rapid pace during the forecast period. Japan dominated the T-cell acute lymphoblastic leukemia market in the region. The market in India is expected to expand at a high CAGR during the forecast period. Major players operating in the global T-cell acute lymphoblastic leukemia market include Pfizer, Inc., Novartis AG, F. Hoffmann-La Roche Ltd., Sanofi, Erytech Pharma, Inc., and Celgene Corporation. These companies have adopted the strategy of acquisition and collaboration in order to strengthen their positions in the global market. This report analyzes the current and future scenario of the global T-cell acute lymphoblastic leukemia market. Increase in patient population with T-cell acute lymphoblastic leukemia, growth of the pharmaceutical industry, improvement in health care infrastructure, and increase in the number of clinical trials are projected to be major drivers of the global market during the forecast period. The global T-cell acute lymphoblastic leukemia market report comprises an elaborate executive summary, which includes a snapshot that provides information about various segments of the market. It also provides information and data analysis of the global market with respect to the segments based on treatment type, end-user, and region. A detailed qualitative analysis of drivers and restraints of the market, and opportunities has been provided in the overview section. Additionally, the section comprises competitive matrix and company profiles along with business overview to understand the competitive landscape in the market. This section of the report also provides market attractiveness analysis by region and market share analysis by key players, thereby presenting a thorough analysis of the overall competitive scenario in the global T-cell acute lymphoblastic leukemia market. Based on treatment, the global T-cell acute lymphoblastic leukemia market has been segmented into chemotherapy, radiation therapy, bone marrow transplant, targeted therapy, and immunotherapy. The segments have been analyzed based on available drug product used during the treatment of T-cell acute lymphoblastic leukemia, cost-effectiveness, and preference for industries. In terms of end-user, the global market has been classified into hospital, clinics, and others. The market size and forecast for each of these segments have been provided for the period from 2016 to 2026, along with their respective CAGRs for the forecast period from 2018 to 2026, considering 2017 as the base year. In terms of region, the global T-cell acute lymphoblastic leukemia market has been segmented into North America (U.S. and Canada), Europe (U.K., Germany, France, Spain, Italy, and Rest of Europe), Asia Pacific (India, China, Japan, Australia & New Zealand, and Rest of Asia Pacific), Latin America (Brazil, Mexico, and Rest of Latin America), and Middle East & Africa (South Africa, GCC Countries, Israel, and Rest of Middle East & Africa). The market size and forecast for each of these regions and the mentioned countries have been provided for the period from 2016 to 2026, along with their respective CAGRs for the forecast period from 2018 to 2026, considering 2017 as the base year. The research study also covers the competitive scenario in these regions. The report also profiles major players in the global T-cell acute lymphoblastic leukemia market based on various attributes such as company overview, financial overview, product portfolio, business strategies, and recent developments. The major players profiled in the market report include Sanofi, Pfizer, Novartis AG, F. Hoffmann-La Roche Ltd., Erytech Pharma Inc., and Celgene Corporation.